07 March 2017, CHECHECHE - A panic-stricken kombi driver who thought he had caused the death of many passengers in a grisly accident which killed one person and badly-injured 13 more along Ngundu-Tanganda Road last weekend fled the accident scene in shock. 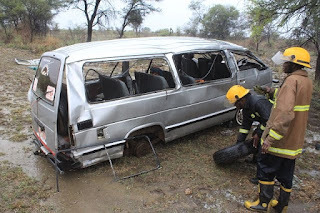 The kombi was travelling towards Chipinge when the accident happened close to the 75 kilometre peg from Croco Motors Chiredzi. Sources said the driver bolted from the vehicle wreck in which his injured conductor was also trapped and took to his heels thinking he had caused the death of many more passengers. The kombi was reportedly over-speeding and had 24 passengers on board before it hit a pothole and overturned thrice.